Alexander Golovko, Commander of Russia’s Aerospace Defence Forces, talked to Rossiyskaya Gazeta about how the station will be used. In a little over a year’s time, the radar station will again be reintegrated into the national missile warning system. New equipment will be installed at the facility and the computing, engineering, technical and technological systems will be upgraded. And as of December 1, 2014, the orbital network of the Sevastopol control centre will be commissioned. 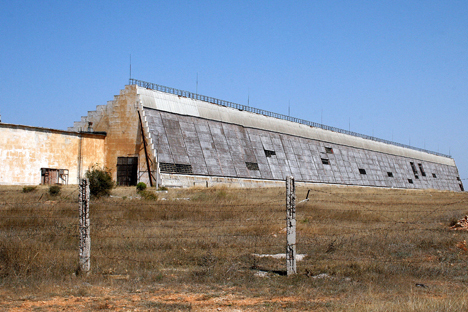 The Dnepr missile warning system radar station and the spacecraft command centre have been in Sevastopol since Soviet times. And there is a deep space communications centre based near Eupatoria. Left to the Ukraine as part of the Soviet heritage, these facilities were not exploited. The radar station was leased by the Russian Defence Ministry for a long time. But when Kiev started demanding exorbitant sums for the use of the station, Moscow decided to not to extend the lease, since the Voronezh modular radar system build near Armavir had entered into active service in the southern strategic region that the Ukrainian radar covered. As for the Eupatoria centre, a replacement was also found for it on Russian territory. Now, after Crimea’s reintegration to Russia, both facilities are taking on a new life. General Golovko said that on December 1, the complex in Eupatoria will have the status of a main testing and command centre for space resources and will enter into the structure of the Titov Main Test and Space Systems Control Centre located in Krasnoznamensk near Moscow. The commander of the ADF specified that the Eupatoria centre “will be undertaking missions related to managing the Russian orbital network’s space apparatuses as well as those related to the Russian space monitoring system.” But first, the facility will be equipped accordingly. Its unique RT-70 radio telescope, which combines huge size with all-weather functionality, sharp “vision” and the capability of working in various radio wave ranges, does not yet have any equal in the world. However, this rare piece of equipment has hardly been used in post-Soviet times, so it is not in the best condition. Each year an increasing number of radar systems capable of tracking missiles launched in various corners of the world are found in Russia. Stations in the Kaliningrad and Irkutsk Regions have already undergone major tests. Over the next three months, two more Voronezh radar systems will enter into experimental and military service – in the Altai District (Barnaul) and in Yeniseysk. This is an abridged version of an article, originally published in Russian by Rossiyskaya Gazeta.